The Fujitsu prototype incorporated a high-speed, high-accuracy iris recognition algorithm developed by California-based Delta ID. Fujitsu said the error rate for the prototype is about one in 100,000. Available in green, black and white, the Arrows NX F-04G is slated to be released at the end of this month in Japan for around ¥55,000 (US$460). There are no plans to sell it outside Japan. I somehow missed the first mention of this collaboration in early March. SRI International’s Iris on the Move (IOM) technology is about to see a number of integrations into mobile products. The company’s iris-scanning technology has been licensed to Samsung and will initially appear in the Samsung Galaxy Tab Pro 8.4 tablet before finding other integrations. [Oleg Komogortsev and a team at Texas State University] are developing a three-layered, multi-biometric approach that tracks the movement of the eye globe and its muscles, and monitors how and where a person’s brain focuses visual attention, in addition to scanning patterns in the iris. The iris is the colored part of the eye. THE eyes have it. Somaliland’s election commission is trialling an iris-based biometric system that it hopes will put an end to duplicate registrations. This would make it one of the most advanced voter registration systems on the planet. 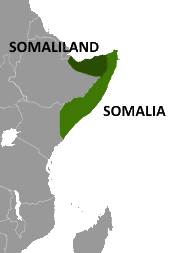 In May 1991, northern clans declared an independent Republic of Somaliland that now includes the administrative regions of Awdal, Woqooyi Galbeed, Togdheer, Sanaag, and Sool. Although not recognized by any government, this entity has maintained a stable existence and continues efforts to establish a constitutional democracy, including holding municipal, parliamentary, and presidential elections. Intel Capital invests in iris biometrics via Delta ID Inc. The iris (left), which gives people “eye color,” controls how much light enters the eyeball. The retina (right) is the structure laying along the inside, back surface of the eyeball that translates light into nervous impulses for the optic nerve to send to the brain. In a camera analogy, the iris would be, well, the iris, since cameras have them, too. The retina would be the film, or in an even better digital analogy, the charge-coupled device (CCD) that translates light into ones and zeros for computer chips. Mobile iris technology is much more straightforward than mobile retina technology and is far more likely to be coming soon to a smartphone near you. After California-based Apple spearheaded fingerprint sensors last year, Samsung Electronics, the world’s largest smartphone maker, is poised to feature the sensors in its upcoming smartphone, the Galaxy S5. Iris will have to wait. Samsung looks to be the first smartphone manufacturer to feature an eye scanner with which to unlock your smartphone. Using two large operational datasets, we find no evidence of a widespread iris ageing effect. Specifically, the population statistics (mean and variance) are constant over periods of up to nine years. This is consistent with the ability to enroll most individuals and see no degradation in overall recognition accuracy. Furthermore, we compute an ageing rate for how quickly recognition degrades with changes in the iris anatomy; this estimate suggests that iris recognition of average individuals will remain viable over decades. There’s a whole lot of technical detail in the full report. However, given the large population sizes, we identify a small percentage of individuals whose recognition scores do degrade consistent with disease or an ageing effect. These results are confined to adult populations. Additionally, we show that the template ageing reported in the Notre Dame studies is largely due to systematic dilation change over the collection period. Pupil dilation varies under environmental and several biological influences, with variations occuring on timescales ranging from below one second up to several decades. Our data suggests that the natural constriction of pupil size over decades does not necessitate re-enrollment of a well enrolled iris. Clarkson’s Center of Identification Technology Research (CITeR), a National Science Foundation Industry/University Cooperative Research Center, is co-hosting the Liveness Detection – Iris Competition this summer. Clarkson, along with the University of Notre Dame and Warsaw University of Technology, have invited developers of iris recognition technology worldwide to submit their devices for the competition. The researchers will test the effectiveness of each device over the next couple of months and present their findings at a conference on biometrics this fall. India: UID contains iris data, too. All applications I’ve heard of are designed to access the UID (unique identification) biometric database have relied on fingerprints, until now. If I’m reading this right, the state of Maharashtra (containing Mumbai & Pune) has some interest in exercising the iris end of the UID database and is preparing a pilot program to do it. The linked headline may have things backwards, though. Aadhaar is UID — a database of identity information including biometrics. Anyone can develop apps that tie in to the UID database, and I’m pretty sure that the organization that maintains the UID database, the UIDAI (Unique Identification Authority of India), has scrupulously avoided competing in the app market by inventing its own apps or developing apps for outside customers whether they are public entities like state governments as in the example linked above, or private entities like banks. That is wise. In maintaining the world’s most ambitious ID repository, the UIDAI has plenty on its plate already and telegraphing to would-be app developers that they are going to be in competition with the guy that “owns” all the information would certainly hinder the app market. So, Aadhaar is not going to “try” iris biometrics. It has already carved out a section of the database dedicated to iris biometrics. The news is that the iris part of the UID database is attracting the attention of end users and the second biggest state in India is taking the first steps toward integrating UID’s iris functionality into its operations.